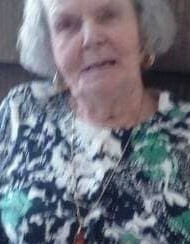 Nancy (Chamberlain) Varin , 80, of Cobleskill NY, gained her Angel wings on Tuesday November 13th, 2018 at home surrounded by her family. Nancy is survived by her Sister, Shirley (Joe) Vacca of Malta NY, Her Son, Clinton Varin of Cobleskill NY, Daughter, Deborah (Wayland) Varin-Sousis of Central Bridge, NY, Granddaughters, Amanda Varin of Richmondville NY, Amber Bink of Cobleskill NY, Autumn (Gus) Dane of Burlington Flatts NY, Nieces, nephews, 10 beloved Great-Grandchildren and many step-grand and great-grandchildren. Funeral Services will be held Monday, November 19th. Viewing hours are 10-11AM at Mereness-Putnam Funeral Home, 171 Elm St., in Cobleskill NY, followed by a graveside service at Memory Gardens Cemetery in Colonie, NY.